This easy instant pot chicken recipe is loaded with tender chicken, tomatoes, bell peppers, kale, carrots and sliced mushrooms. A comforting rustic dish full of Italian flavors that’s perfect for busy weeknights. Chicken Cacciatore is a classic Italian dish that is just perfect for this time of year. 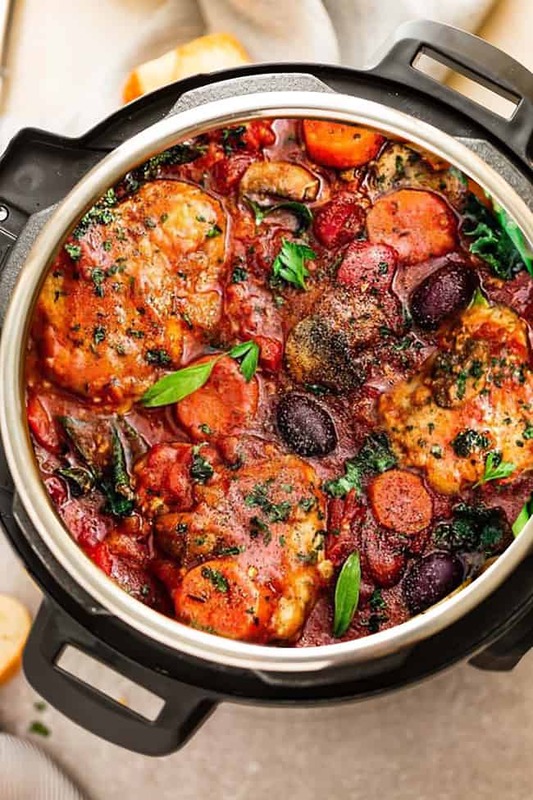 We already have this reader favorite Slow Cooker Chicken Cacciatore recipe on our site and I’ve been dying to share an Instant Pot version with you guys. We had this rustic meal when we visited Italy over 10 years ago and it’s still one of the best dishes from our trip. While we were there, I learned that Cacciatore means “hunter” in Italian and this old Italian “hunter style” dish is usually made with onions, tomatoes and herbs. Since every household prepares their own version differently, sometimes you’ll find recipes that include mushrooms along with other assorted vegetables. This Instant Pot Chicken Cacciatore is based off of my slow cooker version so I’ve included sliced mushrooms, tomatoes, bell peppers, kale, carrots and Kalamata olives. It takes less than 30 minutes to prep and is perfect for those extra busy weeknights. 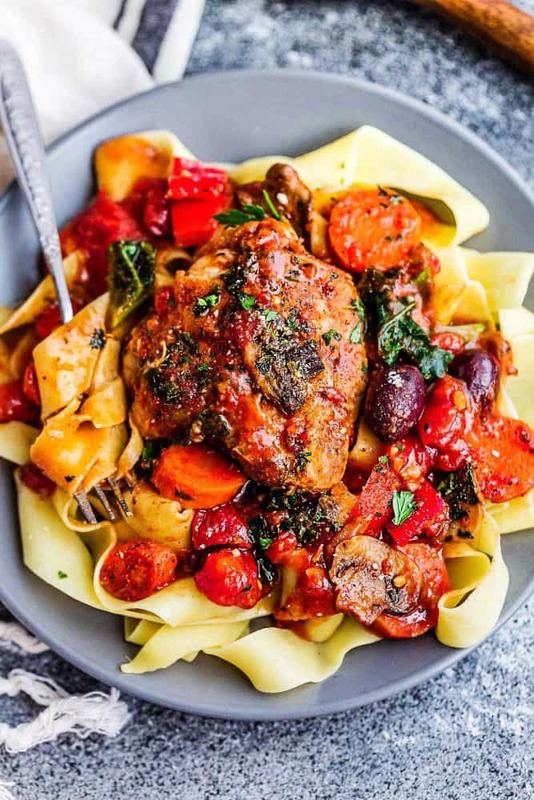 Serve this Instant Pot Chicken Cacciatore over some zucchini noodles or cauliflower rice for a healthy dinner that is gluten free, Paleo, Whole30 compliant, low carb and keto friendly. The rich and flavorful sauce of this Paleo Chicken Cacciatore cooks up nice and thick. If you like keto chicken cacciatore on the thinner side, feel free to add some water or chicken broth to thin out the sauce. You’re going to start off by seasoning the chicken thighs with salt and black pepper. I used boneless, skinless chicken thighs since I think they are more tender but you can certainly use chicken breasts if you prefer. Next, heat oil in the Instant Pot (I have the 6 Quart DUO) and press the SAUTE button. Sear the chicken until you get a nice brown caramel coating. You may have to work in batches, depending on the size of your Instant Pot. Transfer the chicken to a plate. Add the inner pot back to the pressure cooker and add more oil, if needed. Saute the garlic, onion, bell peppers, carrots, mushrooms, diced tomatoes, tomato paste, dried basil, oregano, rosemary, thyme and salt and black pepper to taste. Stir to combine. Add the chicken back to the pot. Press CANCEL then cover with lid. Turn the valve to SEALING and press PRESSURE COOK HIGH (OR MANUAL – for older models). Once the Instant Pot comes to pressure and cooks for 10 minutes, do a QUICK RELEASE. Open the lid carefully and stir in the olives and kale. OPTIONAL STEP: If you prefer a thicker stew, witch to SAUTE mode and stir in an arrow root starch slurry (or use Xanthan gum for low carb) and cook for about 2-3 minutes until the stew bubbles and thickens up. 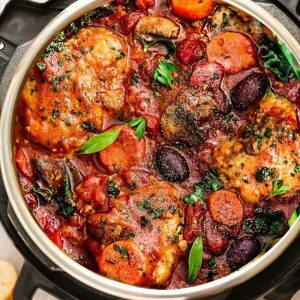 IS INSTANT POT CHICKEN CACCIATORE FREEZER-FRIENDLY? This dish works great if you want to make it ahead on your meal prep Sunday. It heats up beautifully and I think tastes even better on the next day. If you want to freeze this for next time you’re craving this humble dish, I would suggest shredding the cooked chicken first since it will be easier to reheat. Portion any leftovers out in air-tight containers or freezer-friendly zip top bags and store in the freezer for up to 3 months. When you’re ready to eat, place the freezer bag to thaw overnight in the fridge. WHAT ELSE CAN I SERVE WITH THIS CHICKEN RECIPE? You can serve this delicious dish with a number of sides. For low carb, keto, paleo & Whole 30 options, you can serve with a side of roasted broccoli, Brussels sprouts , a healthy salad or cauliflower rice. And if you want to stick to the original version of this old Italian style dish, serve over a plate of pasta and some garlic bread to soak up that amazing sauce. 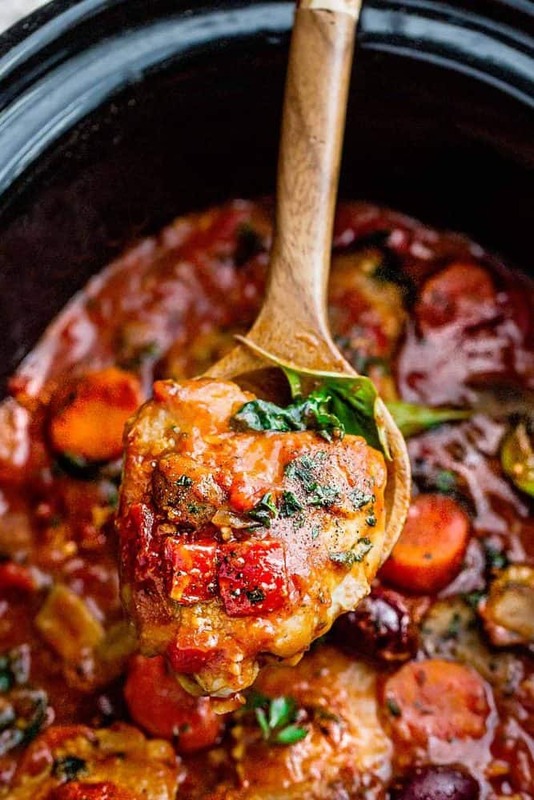 Instant Pot Chicken Cacciatore - an easy pressure cooker meal loaded with tender chicken, tomatoes, bell peppers, kale, carrots and sliced mushrooms. A comforting rustic dish that's perfect for busy weeknights with the best hearty and cozy Italian flavors. Season chicken with salt and black pepper. Heat olive oil in the Instant Pot and press the SAUTE button. Sear the chicken until you get a nice brown caramel coating. You may have to work in batches, depending on the size of your Instant Pot. Transfer the chicken to a plate. Add the chicken back to the pot. Press CANCEL then cover with lid. Turn the valve to SEALING and press PRESSURE COOK HIGH (OR MANUAL - for older models). Serve hot over zucchini noodles, cauliflower rice, pasta or your favorite sides. This recipe Is delicious and so hearty! My Instapot has had trouble getting pressurized both times I made this but a 1/2 cup of chicken broth seems to do the trick. Plus more olives….because…well, olives. Thanks for this great recipe. Its perfect for the sub zero temperature/hibernation mode we are heading into this weekend. THis was amazing! Will DEFINITELY be making aGain.